Downtown&apos;s One Eyed Gypsy bar has quite the spirited past. It has continuously been run as a bar since at least 1899, when J.H. Klohn got a license to sell alcohol — and maybe even earlier. Since then, it&apos;s operated as a brothel, a speakeasy, a bootlegging operation, and a biker bar. There are rumors of countless undocumented murders and cases of foul play in the space that is now inhabited by Dana Hollister&apos;s quirky cocktail lounge, and many, including the staff, believe that it&apos;s haunted. 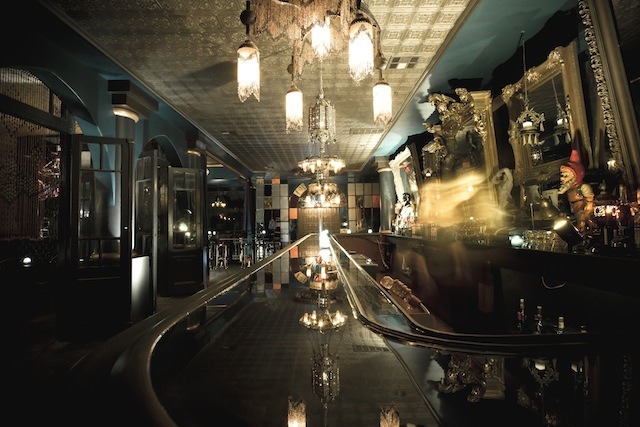 According to the Ghost Hunters of Urban Los Angeles, many of the One Eyed Gypsy&apos;s barkeeps believe that the bar is haunted by a female, most likely a former madam or the before mentioned murdered waitress. Perhaps it&apos;s the spirit of a 26 year old waitress, Miss Anna Feliz, committed suicide a couple of blocks away in 1902. Others believe it it could also be a male, considering there&apos;s quite a bit of activity around the men&apos;s restroom. "Employees claim that voices call out from empty rooms, and unseen hands will touch, push, and sometimes pinch (or "goose") them in the wee hours of the night. Objects move, doors open and close, and lights and faucets turn on and off. Most of the activity seems to occur around the men&apos;s restroom, but one well-witnessed event occurred at the bar when a crown that sits upon the head of a stature (high above anyone&apos;s reach) flew across the room." This Friday the 13, the Ghost Hunters of Urban Los Angeles will be hosting a spirited evening at One Eyed Gypsy from 8 p.m. to the "witching hour." Of course this will all sound like a bunch of superstitious nonsense to those who don&apos;t believe in paranormal activity. Even if that&apos;s you, the bar is worth checking out for its awesome happy hour and skee ball machines.